Antanas Smetona (Lithuanie pronunciation: [ɐn̪ˈt̪äːn̪ɐs̪ s̪ʲmʲɛt̪oːˈn̪ɐ] ( listen); 10 August 1874 – 9 Januar 1944) wis ane o the maist important Lithuanie poleetical figurs atween Warld War I an Warld War II. He servit as the first Preses o Lithuanie frae 4 Apryle 1919 tae 19 Juin 1920. He again servit as the last Preses o the kintra frae 19 Dizember 1926 tae 15 Juin 1940, afore its occupation bi the Soviet Union. He wis ane o the famous ideologists o naitionalism in Lithuanie an aw. Born in the veelage o Užulėnis, Taujėnai landwart destrict o Ukmergė Destrict Municipality, Antanas Smetona wis sent tae the primar schiol in Taujėnai. Graduatin frae the Palanga Pre-Gymnasium in 1893, he passed his entrance examinations intae the Samogitian Diocesan Seminary in Kaunas, wi thochts o becomin a Catholic priest, but various circumstances suin thareefter chyngit thir plans, an he enrolled at Jelgava Gymnasium (heich schuil) in Latvie. Here, thegither wi Jonas Jablonskis, Vincas Kudirka an ithers, he belonged tae a secret Lithuanie students' organisation. This organisation wis naitionalistic, an anti-Czarist in natur. In the Hairst o 1896, he organisit the resistance o students against obligatory attendance o the Roushie Orthodox Kirk, an wis expelled frae the Gymnasium, but wis later alloued tae study at the Gymnasium No.9, in Saunt Petersburg. Efter graduatin frae this Gymnasium in 1897, Smetona entered the Faculty o Law o the Varsity o Saunt Petersburg. He jynt the activities o the secret Lithuanie Student Organisation at the Varsity, an wis made its chairman. He became involvit wi the publishin an dissemination o Lithuanie beuks. On twa occasions he facit the threat o bein expelled frae the Varsity, an experiencit bein arrestit an a short impreesonment. Efter his graduation frae the Varsity in 1902, he wirkit at the Agricultural Bank o Vilnius. Twa years later he marriet Sofija Chodakauskaitė. Frae his vera first days in Vilnius, Smetona became involvit in the activities o various Lithuanie naitionalist groups, an jynt the Lithuanie Democratic Pairty, which he representit in the Great Seimas o Vilnius. He wis later electit intae its Presidium. In 1904 an 1907, he wis on the staff o the Lithuanie newspapers, Vilniaus Žinios (The Vilnius News), an in 1905-1906, editit the weekly Lietuvos Ūkininkas (The Lithuanie Fermer). In 1907, Smetona an the Rev. Juozas Tumas-Vaižgantas established a ventur tae prent the newspaper Viltis (The Howp), an stairtit publishin an circulatin it. In Viltis, Smetona advocatit naitional unity; he wis ane o the incorporators o the Aušra (Dawn) company for the publishin o Lithuanie beuks an aw, a member o the Lithuanie Mutual Aid Society o Vilnius, the Lithuanie Learned Society, the Vilniaus aušra (The Dawn o Vilnius), an Rytas (The Fore-nuin) eddication societies, the Rūta Art Society an mony ither societies, taucht the Lithuanie leid at Vilnius schuils. In 1914, he stairtit publishin Vairas (The Rudder), a new bi-weekly magazine. Durin the First Warld War, he wis the 1st Vice-Chairman, an later Chairman, o the Central Committee o the Lithuanie Relief Society for helpin victims o the war. In the Simmer o 1916, Antanas Smetona, thegither wi ither Lithuanies frae Vilnius, presentit a memorandum tae the German Chief Commander o the Eastren Front, in which he demandit the richt o the Lithuanie naition tae hae an unthirlt State. On 6 September 1917 he stairtit printin the newspaper Lietuvos Aidas (Lithuanie's Echo), wirkit as its publisher an its editor-in-chief. In the first issue o the newspaper, Smetona wrote that the maist important goal o the Lithuanie naition wis the re-establishment o a unthirlt Lithuanie state. Atween 18 September an 22, 1917, he pairticipatit in the Lithuanie Conference in Vilnius, an wis electit Chairman (1917–1919), o the Cooncil o Lithuanie (later Cooncil o the State). 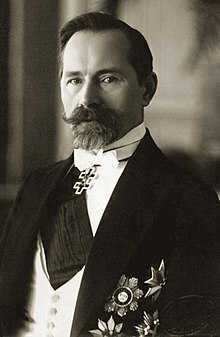 On 16 Februar 1918, Antanas Smetona signed the Act o Unthirldom o Lithuanie. Atween Dizember 1918 an Mairch 1919, he livit primarily in Germany an the Scandinavie kintras, solicitin loans for the cause o Lithuanie unthirldom. On 4 Apryle 1919, the State Cooncil o Lithuanie electit Smetona the first Preses o the Republic o Lithuanie. 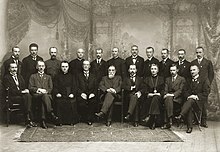 On 19 Apryle 1920, the Constituent Assembly electit Aleksandras Stulginskis Preses. No re-electit tae the Seimas, frae 1921 throuoot 1924 he editit several periodicals, as Lietuvos balsas ("Voice o the Lithuanie"), Lietuviškas balsas ("Lithuanie Voice") an Vairas ("The Steerin Wheel"). Efter the Klaipėda Revolt o Januar 1923, in the Memelland, which haed been separatit frae Germany, he wis made commissioner thare on 20 Februar, but due tae disagreements wi Prime Meenister Ernestas Galvanauskas, he resigned frae his post. In November 1923, authorities impreesoned Smetona for several days for publishin a airticle bi Augustinas Voldemaras, in Vairas. Atween 1923 an 1927, he wis a assistant Professor at the Varsity o Lithuanie - at first at the Chair o Airt Theory an History an later at the depairtment o Filosofie. He lectured on ethics, antique filosofie, an gae lecturs on Lithuanie linguistics. In 1932, he wis awairdit a honorar Ph.D. at the Vytautas Magnus Varsity. Smetona pairticipatit in the activity o the Lithuanie Riflemen's Union that haed stagit the Klaipėda Revolt, which gae him greater name-recognition. Mair than ance, he wis electit tae its central buird. Atween 1924 an 1940, he wis the vice-Chairman o the Buird o the Internaitional Bank, an ane o the members o a nummer o societies an companies. Antanas Smetona wis ane o the leaders o the coup d'état o 1926, which deponit Preses Kazys Grinius, an Smetona ance again became Preses on 19 Dizember o that year (twa ithers briefly held the office durin the coup, which began on 17 Dizember, afore Smetona wis formally restored tae the Presidency). He designatit Augustinas Voldemaras as Prime Meenister. Ane year later he suppressed the pairlament, an on 15 Mey 1928, wi the appruival o the govrenment, he promulgatit a new Constitution o the Lithuanie State wi mair extensive presidential pouers. In 1929, he remuivit Voldemaras an became authoritarian heid o state. He wis re-electit Preses in 1931 an 1938, an remained in office till 15 Juin 1940. Lithuanie wis occupee'd bi Soviet troops in 1940, as a consequence o the 1939 Molotov-Ribbentrop Pact atween Nazi Germany an the Soviet Union. Efter the USSR presentit a ultimatum tae Lithuanie in Juin o that year, Smetona proposed airmit resistance against the Soviets. The majority o the govrenment an the commanders o the airmy did no concur wi this proposal. On Juin 15, Smetona turned ower the duties o Preses tae Prime Meenister Antanas Merkys on an interim basis as per the constitution, an fled tae Germany wi his faimily. Shortly efterwaird, the Smetonas fled tae Swisserland. A day efter Smetona left the kintra, Merkys annooncit he haed deponit Smetona an wis nou preses in his awn richt. Twa days later, Merkys wis pressured intae appointin the mair pliant Justas Paleckis as prime meenister an resignin hissel. Paleckis then became actin preses, an wis uised as a puppet tae owersee the feenal stages o Lithuanie bein incorporatit intae the Soviet Union a month later. Lithuanie's current offeecial poseetion on the matter is that Merkys' takeower o the presidency wis illegal, syne Smetona niver formally resigned. Tharefore, Lithuanie offeecials argue, aw subsequent actions leadin up tae the Soviet annexation wur ipso facto void. In 1941, Smetona emigratit tae the Unitit States, an livit in Pittsburgh an Chicago afore settlin in Cleveland, Ohio in Mey 1942 wi his son Julius' faimily. While in exile, he began wirk on a history o Lithuanie an on his memoirs. Smetona dee'd in a fire at his son's hoose in Cleveland, on 9 Januar 1944, an wis buriet thare. His wife Sofija dee'd in Cleveland, on 28 Dizember 1968, an he haed a dochter, Birutė an aw. In 1975, his remains wur muivit frae Cleveland's Knollwood Cemetery mausoleum tae All Souls Cemetery in Chardon, Ohio. ↑ "Antanas Smetona". Find-A-Grave. URL accessed 2006-09-26. "Smetona, Antanas". Encyclopedia Lituanica V: 231-235. (1970–1978). Ed. Simas Sužiedėlis. Boston, Massachusetts: Juozas Kapočius. LCC 74-114275. (in Lithuanie) Banevičius, Algirdas (1991). 111 Lietuvos valstybės 1918-1940 politikos veikėjų. (in Lithuanie) Alfonsas Eidintas (1990). Antanas Smetona. Vilnius. ISBN 5-417-00376-X. Wikimedia Commons haes media relatit tae Antanas Smetona. This page wis last eeditit on 14 Mey 2018, at 06:19.